The Semovente 90/53 M41M (shortened as 90/53 M41M) is a Rank II Italian tank destroyer with a battle rating of 3.7 (AB/RB/SB). It was introduced in Update 1.85 "Supersonic". Armour is not great, but the gun shield protects from .50 cal fire from the front and the very sloped hull armor can bounce shots. The back is very vulnerable as your crew can be knocked out by anything and the ammo is also stored there. One artillery shell behind you can one shot the 90/53. 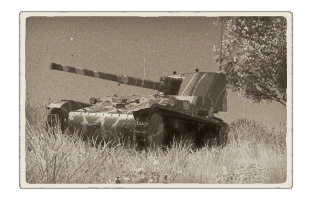 The Mobility is good on flat terrain and even on some slopes, about the same as other Italian tanks on the same chassis. Due to the 90° horizontal fire angle, the 90/53 can drive diagonally while aiming. Skins and camouflages for the 90/53 M41M from live.warthunder.com. This page was last edited on 3 April 2019, at 16:21.